If you’re new to the idea of living food, have a look at my beginner’s guide. When you tell people that raw food is good for you, many get scared and think they must switch to an all-raw diet immediately, which puts them off. It’s absolutely not necessary to go 100% raw, you can slowly start incorporating living food into your daily lives and find the perfect solution that works best for YOU. I am a firm believer though that everyone can benefit from at least 50% raw, and it’s easier to do than you may think! Breakfast is usually the easiest meal of the day to eat completely raw. You’re probably at home, with no one judging you, and you can easily source some yummy fruit for a fruit salad, fruit porridge or smoothie. If you have access to raw products, maybe you could even buy some raw granola and make some nut milk yourself for a heavier breakfast. Once you get used to it, you will feel so much better in the mornings and will go to work feeling happy, nourished and healthy! Alternatively, if you usually don’t eat much for dinner, try switching your usual nachos and guacamole for a salad. My body has never liked eating in the evening, so I just have a little bit of fruit a few hours before going to sleep. 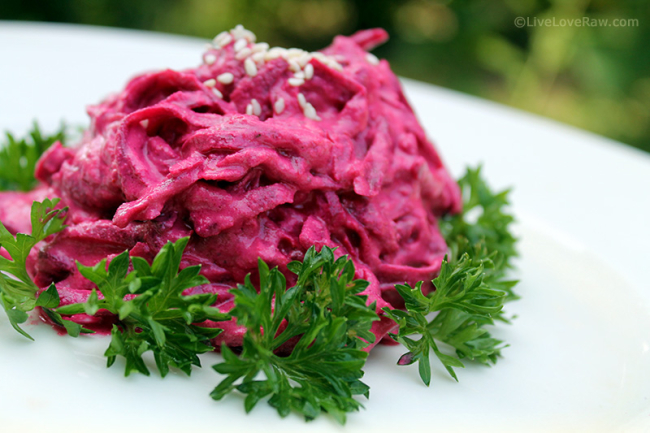 If you’re not fully raw, make this with cooked beetroot – you’ll love it! Click the photo for the recipe. Yes…it really is! Once you learn how to make a few awesome raw sauces, dips or spreads, you can make any dish taste divine, and no one will know it’s raw! It’s amazing what you can do with just a simple cashew sour cream – you can use it as a salad dressing, as a dip, as a spread, as mayo substitute in a sandwich, in your pasta dish instead of cream cheese, in your risotto…the possibilities are endless!! Perhaps you went to a raw food workshop and learnt how to make raw pasta but don’t like the taste of zucchini noodles? That’s alright, just make the healthiest normal pasta you can find (there are plenty of options, from buckwheat to rice pasta) and use the raw sauce instead. Or make a normal wrap with lots of raw vegetables and sauce inside. Switching even just that one little thing can make a difference, especially if you’re substituting dairy, and your body will thank you for it. If however you don’t have access to raw sauces, why not change something else? For example, if you have already learnt how to make raw bread, or you can buy some in a shop, use that as your bread substitute for sandwiches and chips. Everyone loves to snack, whether you’re at the office between meetings, or at home watching movies. Ask yourself what is it that you love snacking on most: sweet, salty or spicy, and do it raw! For example, if you mostly snack on sweet things, keep some dried or fresh fruit at hand everywhere you go. If you keep some in your bag or at the office, you’re less likely to go searching for something else to eat. If you prefer savoury snacks, get a hold of some kale chips – there are so many flavours you can get! Nuts are also a good option as they will fill you up quickly, just make sure not to overdo it. If you’re really trying to stick to at least 50% raw, just divide your plate in half – half cooked, and half raw. If you’re making cooked lunch, just add some salad on the side. Make sure to eat the raw food first though, as it will digest quicker than the cooked stuff, and eating the raw food first will make it easier on your stomach. Raw desserts are super easy, fun to make and are one of the best ways of introducing raw food into your diet, and your family’s. People like sweets, and if healthy sweets taste good, then no one will question it. Think it’s too much for your folks? If even my uncle and aunt ask for seconds of my raw cakes, I’m sure your’s will soon too! Make something simple to start with, like a chocolate mousse or brownies (I’m currently not selling raw chocolate, but here’s a nice brand I recommend). Put it together with some fruit and you’ve got yourself a delicious and healthy dessert. Giving up sugar was the best thing I’ve ever done in my life as until then I never realised how addicted I was to it. If you don’t add any raw food to your diet, I ask that you at least consider getting rid of the sugars – this does’t just include cakes and candies, but also store-bought sauces and dried fruit. For some advice on how to give up sugar, please read this article. With anything and everything! My mum never told me to not play with my food as a child, so now I love playing with my food! I try different food combinations, different textures and flavours. Sure, they don’t always turn out well (never making raw pea soup again!! ), but 98% of the time I get really excited because I’ve made something new and delicious. When you get excited about raw food, and when you get good at it (be patient with yourself, it may take a few tries to get those sushi rolls nice and tight), you will want to make more, and will naturally start including more raw foods into your life. …to the Earth…and your body. Both of them will tell you what you need right now in this climate at this particular time of the year. Try to eat seasonally as much as possible – buying strawberries in the middle of winter is not going to be as beneficial for your body as they will be later on in the year. FANTASTIC VIDEO! Thank you for this, I’ve been meaning to find ways of making my family healthier, I think I’ll start with the 50/50 – what a GREAT IDEA!